Really 2.5 stars but it's a sentimental favorite. I first read this collection of young-adult SF stories sometime in my middle-school or early high-school tenure. Recently, I reread the stories, and (as an adult with a more critical, less innocent eye) they're really not 4-star good. The heart is there but the writing is amateurish. I can see, though, how my initial enjoyment of the book fed into the development of reading preferences. With the exception of the first few stories, Karl can't generate sufficient suspence or interest to carry her ideas. 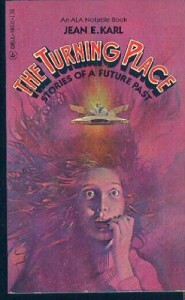 And it's the first story, "The Turning Place," that's really worth reading. The collection as a whole is a series of stories that charts the course of human history after we're almost wiped out by aliens fearful of our continued expansion into space (the Clordians are only a few decades ahead of us technologically and made it into space just ahead of us). They all deal with humanity's growing maturation as a species, and they all focus on the actions of young people in that advance (without being maliciously "anti Old Folks"). "The Turning Place" explains how the Clordians destroyed all terrestrial, carbon-based life on the planet. A few isolated spots survive the "Clordian Sweep," and humanity slowly struggles to recover. There are two reasons these stories continue to "stick" in my head. The first is that my imagination was fired up by the sheer breadth of the devastation -- a genocide surpassing the Permian die-off (95%+ of land species). The second factor is that Earth, when it recovers, doesn't strike out to destroy Clord but sends ambassadors to show them that there is a better way. A theme of peaceful co-existence and cooperation that was (and is) relatively rare in the SF. And Karl manages it without a fundamental change in human nature. Yes, the species is changed by the Sweep but not so radically that we lose our human identity nor does it make us immune to the irrationalities that currently plague us. In the final analysis that would be the reason to take a look at these stories: A basic sense of optimism that we can achieve a bright future relatively free of the "four horsemen." So I give a qualified recommendation. The ideas Karl wants to highlight are good but the execution could be better.